Stop messing around with your website. If you are “wide” and publish books on Kobo, you may be interested in learning how to make a little bit extra from your Kobo book sales. I’m fairly new at this self-publishing thing, yet I’ve already earned over $1,000 in sales from Kobo. I also get to earn a little tiny bit of extra money when people buy my books through my Kobo affiliate links. The commissions aren’t huge, but extra money is extra money, right? See below for what I made in affiliate income from Canada over the past 30 days. It’s not much, but I’ll take that extra $34.62, please. You too can start making a little extra income from Kobo. Keep reading to learn how. Scroll down until you see the “Publisher” section (because that’s what you are). You’ll be recommending Kobo products (aka mostly your own books) on your author website. Click Join Us. That button will take you to another page. Just click another button to Join our Network. After that, you’ll have to enter some company/tax/contact information. It can look a little daunting at first, but you’ll manage, I’m sure. Because I’ve been an affiliate of theirs for a while, I can’t recall if there’s any kind of delay or approval period, so be patient if needed. Once you’re approved, you’ll have access to a 💩load of potential advertisers. I’m not kidding. You could earn affiliate income from several programs associated with lots of brands that have absolutely nothing to do with Kobo (e.g. Air Canada Vacations, Calvin Klein, etc.) Feel free to apply to other affiliate programs as you see fit, but this is neither here nor there. First you’ll have to search for the various Kobo affiliate programs. You do that by entering “Kobo” in the search field in the top-right corner of your screen (after logging in the Rakuten affiliate website). Search results will appear below the search bar on your screen. Kobo has several country-specific affiliate programs. 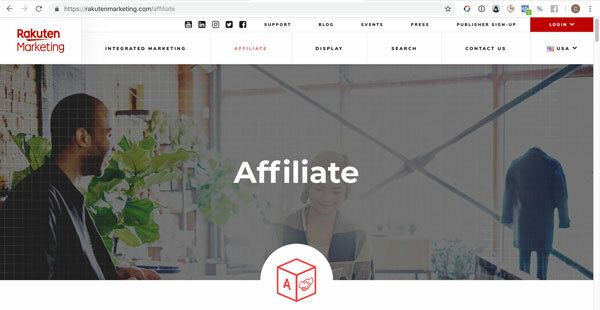 After talking with some well-informed Kobo staff in November 2018, they assured me that you can earn affiliate income from ALL countries just by joining one of their affiliate programs. You’ll see several programs along with the commissions that you could possibly earn. Here’s a screenshot of what two programs looked like at the time I wrote this, but numbers may vary in the future. Select the one program that makes the most sense to you (based on currency and items for which you can earn commission) then click the “Apply” button on the right to submit your request. Once approved, the right column will show “Approved” in green, as shown above. I’ll be honest and say that this part gets a little tricky, but feel free to bookmark this page and come back to these instructions if you ever forget. I personally keep a handy text file (in Notes) with all of my affiliate links once I create them. Remember how I talked about Kobo having several programs for different countries? At first I was doing this wrong and only using the Rakuten tool, but my links never redirected to the other stores when I tested them in other countries. A kind soul at Kobo explained how to properly create links that WILL redirect to your readers’ correct store fronts AND allow you to earn affiliate income from all those countries, so here are the correct instructions. Copy and paste your ISBN so it replaces ISBN-GOES-HERE in the previous line (no hyphens). Your basic link should take you to the correct book page when you test it in a browser, but it does NOT contain your affiliate code (the bit that gets you those extra pennies). 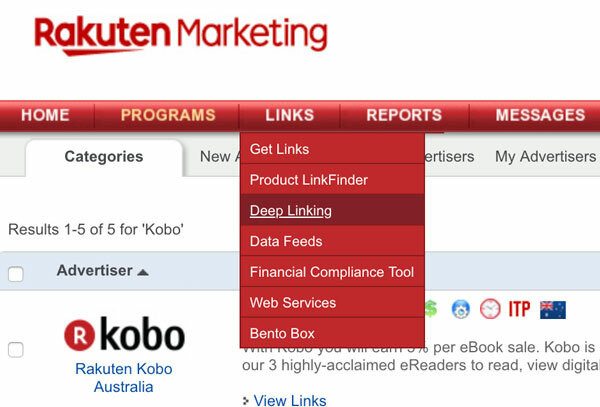 This is where you’ll need to login to Rakuten’s affiliate website, then access their “deep link” features through the LINKS menu. See below. From there, make sure to select the correct affiliate program (whatever country you joined), then paste your basic link + ISBN in the field, then create that URL with the options shown below. The stuff that appears in the bottom box (starting with https://click.linksynergy.com/…….) is your affiliate link that will redirect to various countries. Make sure to test it first, then go ahead and use it everywhere: on your website, social media channel, email, etc. The good news? You’re not limited to your own books. 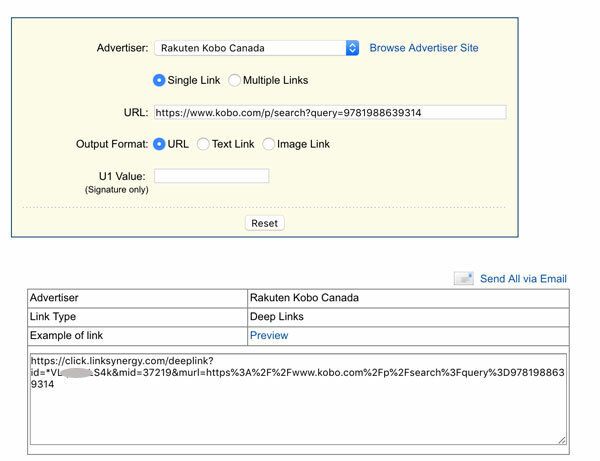 You can use those affiliate links to point to any page on the Kobo website. 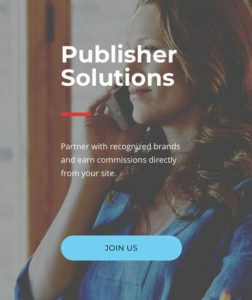 By the way, if you use Draft2Digital’s awesome Books2Read.com service (also known as UBL or Universal Book Links), you can enter your Kobo affiliate code in there and earn affiliate income from your UBLs as well. A separate blog post will soon be added to talk about this. The Social warfare plugin has a security vulnerability that is being exploited. Please update to version 3.5.3 ASAP. Learn more here. NOTE: GoCreate.me's themes do NOT use this plugin. This warning is posted as a courtesy in case YOU are using it. ... View another security tip! "I’m a relatively experienced amateur at WordPress and had three self-hosted blog sites and a clunky self-hosted author site, so I jumped at the chance to soup up my author site for a reasonable price. I was blown away! The site was up quickly and is just what I imagined a “books in series” site might look like. Caro added little touches individual to me. She was a pleasure to deal with. I’ll be back for more!" Consider chipping in a little something so I can create more WordPress themes and tutorials. This website contains affiliate links for products we like, use, and trust. You won't spend a penny more if you make a purchase after clicking one of GoCreate.me's affiliate links, and the small commissions earned help cover our hosting costs.